Lots of things are continuing to happen in the world of flood mitigation and insurance. Miami has passed its first law designed to protect against sea level rise, Governor DeSantis this past week selected the state’s first Chief Science Officer to sort the myriad of climate data, and Congress is upset with FEMA for moving ahead with its new risk rating system in federal flood insurance without approval. Of all East Coast Florida communities, Miami has been particularly susceptible to this current period of sea level rise. Nearly 25% of the city is within the Coastal High Hazard Area (CHHA), as defined in the Miami Comprehensive Neighborhood Plan and state statutes. That’s more than 12,000 properties, on about 5,700 acres. 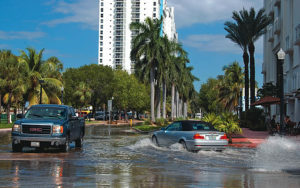 In late March, the Miami City Commission passed an ordinance changing the zoning code to allow new construction and redevelopment to have up to five feet of freeboard above the Base Flood Elevation. (Base Flood Elevation is the expected height of water in a 1-in-100 year flood event and freeboard is the extra height allowed above at which the lowest finished floor is built.) The code had required one foot of freeboard, but the option for up to five is in keeping with the latest FEMA recommendations to incorporate more freeboard in construction and reconstruction within areas prone to flooding. The new zoning also allows a five foot increase in the current height of ground floor retail space, from 25 feet to 30 feet. Parts of coastal Miami-Dade County and along the Miami River are susceptible to regular flooding during storms, king tides, and supermoons. Governor DeSantis is taking Florida’s environmental challenges seriously. This past week he appointed Dr. Thomas Frazer to the newly created role of state Chief Science Officer. Frazer has served as director of the University of Florida’s School of Natural Resources and Environment. His specialty is the effects of nutrient enrichment in aquatic systems, such as rivers and estuaries, which should come in handy in dealing with Florida’s blue-green algae problem in the southwest and southeast. 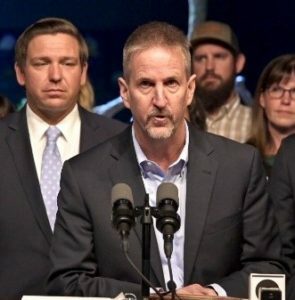 “As one of Florida’s leading environmental researchers, Dr. Frazer understands the unique water issues facing our state and the actions we must take to solve them,” DeSantis said in a press release. Meanwhile, some leaders in Congress say FEMA is moving too far, too fast with its announced plans to update its risk rating and pricing system for the National Flood Insurance Program (NFIP) next year. While Congress has fiddled with long-term reauthorization of the NFIP for two years, FEMA leadership has moved ahead and announced a series of measures to modernize the program that is $21 billion in taxpayer-funded debt. Senator Charles Schumer (D-NY) wants the NFIP’s Risk Rating 2.0 plan halted until some key questions are answered. Schumer’s questions include how the new rates would be calculated, how terms such as “logical rating variables” are defined and which private date companies are involved, and how FEMA has calculated the “affordability” of new rates and how it will help residents whose new rates may no longer be affordable. Schumer said he also wants to ensure that FEMA’s plan has better oversight of the insurance companies that participate in the NFIP, given the claims problems during 2012’s Superstorm Sandy. While Congress fiddles, America is flooding. Congress tries to legislate, while the NFIP regulates toward better market-based solutions. Together with a growing private flood insurance market – that can be encouraged by state regulators – more Americans can have affordable and available flood insurance.